Can I book by telephone ? 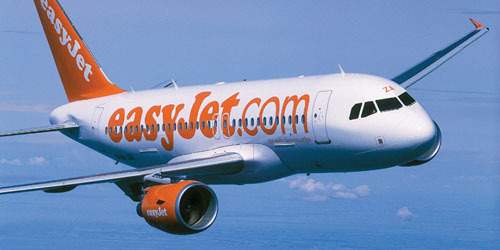 Yes, you can book with any of our Siesta Travel Shops by telephoning 01642 257920 during office hours. Please note that Web/Online Discounts are not available to bookings made via our Offices and your booking may not be accessible online for further payments or to view/print your own invoices. How much is your deposit and when do I pay the balance ? 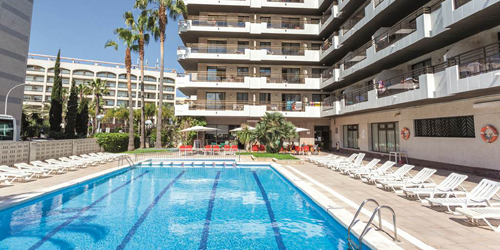 Deposits are payable for infants and free children and all deposits are non-refundable in the event that you later cancel or change your holiday arrangements. Late Bookings & 'Flexis' are payable in full at the time of booking. Can I book a coach seat without any accommodation ? Yes. You will be charged the adult transport cost, plus a 'seat only' supplement of £20 per person, plus any pick-up and/or departure supplements. Add £30 for Benidorm. If there are any other extras, such as en-route accommodation charges prior to arrival at your desination, this will also be payable. Seat onlys are only sold subject to availability and are not sold at times when we need to 'protect' our coach seats to sell with our own accommodation. Can I pay in Euros ? Yes! When you make a booking or make a payment in 'My Account' you will be given the option of paying by credit card in £ British pounds or € Euros. All our holidays are priced in British Pounds (GBP) however when you search for a holiday you have the option of being quoted in € Euros. The amount charged is dependant on the the prevailing exchange rate at the time of payment, therefore unless you pay for your holiday in full at the time of booking the exchange rate when you make subsequent payments may differ. If you prefer to pay by bank transfer you can book by telephone with our Sales Advisors on +44 (0)1642 257920 and transfer your payment directly into our Euros bank account - we will give you our bank details at the time of booking. Please note, however, that due to the delay before the payment will arrive in our account we cannot offer cash transfer payments for 'Late' bookings, Superdeals or any discounted holidays. Any 'extras' that are payable in resort (e.g. Gaz charges, Housekeeping Deposits) can always be paid in Euros rather than pounds. Why have I been surcharged ? Our holiday prices have to be calculated upto 19 months in advance of your actual departure date.The price of oil and, in particular, the price of fuel, can rise considerably in that time. The same goes for the strength of the Euro against the Pound, as we pay all our suppliers in Euros eventhough as a British Operator our holidays are all priced in Pounds. In addition, other factors such as increases in the rate of tourist tax, road tolls or local VAT rates all have a considrable part to play in the final cost of your holiday. Wherever possible we absorb any increased costs ourselves, however if these increases are so severe that we cannot off-set all of the added charges, regrettably, we will have to pass on some of the costs to our clients in the form of surcharges. To ensure that our costings are fair and accurate we do not issue surcharges until around 10 weeks prior to each departure. NB. Flight Clients - If your airline impose any additional surcharges we will advise you as soon as we are made of this by your airline. 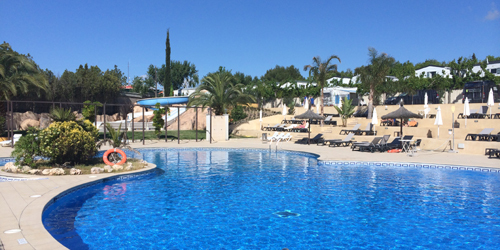 Accommodation Voucher and Resort Arrival Information are issued 3-4 weeks prior to your resort arrival by email, along with a link to our website where you will be able to view and download your Resort Arrival information and other documents relating to your holiday. NB. It is extremely important that all Accommodation Only clients take a printed copy of your Accommodation Voucher on holiday with you, as it is required by your Holiday Parc or Hotel Reception upon arrival. If you would like Accommodation Vouchers and Arrival Information sent out to you in the post, there is a £20 Administration fee. Which days of the week do your Coach Holidays depart ? Our Disneyland Paris stop-over holidays depart on Tuesdays. Scenic Tours, Escorted Tours and Winter Breaks have various departure days - please refer to the itinerary for the relevant tour for details. Do your coaches cross by Ferry or Eurotunnel ? Can I book a particular seat on your coach ? You can request a particular seat and we will try to meet requests wherever possible. If more than one person requests the same seat, precedence will normally be given to the earlier booking. In matters relating to the lower deck precedence will be given to those with mobility/disability problems (if we have been informed of the full nature of the disability), however, we can never guarantee that a particular seat will be available and all bookings are accepted on the condition of being able/willing to travel on the upper or lower deck as necessary. • One suitcase max.71x45x25cm and weighing no more than 20kg. Sorry, no pooling/sharing of allowances (one large case between two people) is NOT permitted due to health and safety restrictions. We issue one luggage label per seat with your tickets. Any luggage not bearing this label, outward or homeward, will refused. Any extra items such as a fully collapsible umbrella style buggy or collapsible manual wheelchair (not mobility scooters) will be carried free of charge ONLY if they have been declared at the time of booking via 'Transport Requests' and issued with a luggage label. Any items without a luggage label will be refused. Infants do not receive a luggage allowance, unless they have purchased a coach seat, and will share the allowance of an accompanying adult. Which films are shown onboard your coaches? Clients travelling on our Club Class PREMIER coaches have their own personal seatback TVs with "touchscreen" control. They choose their own viewing from 100s of titles (films, comedy and TV shows) and have the ability to pause, rewind or fast forward their own screens. Clients travelling on our Club Class 'Original' coaches are shown a selection of films and TV shows on the main screen - one screen is located at the front of the upper deck and one at the front of the lower deck. The titles shown will comprise family favourites and recent releases and vary by coach. If you are unsure which coach you have booked simply check your Booking Confirmation Invoice. Under "Transport" it will say "Club-PREMIER" or "Club-Original". Travelling with an infant ? 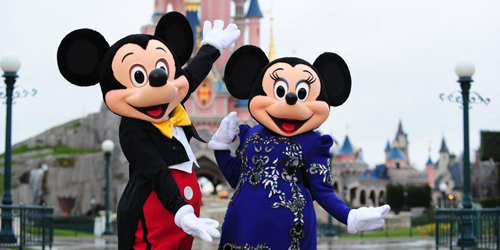 Infants aged 0-23 months at time of your return journey (0-35 months for Disneyland Paris) can travel free of charge on their parent's lap without a coach seat or luggage allowance (maximum 1 infant per accommodation). For the comfort of other passengers each infant must be accompanied by at least 2 persons with seats. It is not possible for us to accept travel cots on our coaches under any circumstances. Cot hire is available at all our destinations - please contact us to make arrangements. One lightweight, fully collapsible, umbrella style buggy will be carried free of charge as long as it has been declared at the time of booking via 'Transport Requests' and issued with a luggage label (sent with your tickets). Buggies are transported in the luggage compartment and are not accessible during the journey. If a coach seat has been purchased for your infant a forward facing car seat may be used onboard the coach. If a coach seat has not been purchased for your infant (shown on your invoice as 'infant') they will be travelling on their parent's lap and therefore you may not bring a car seat. If you change your mind after booking and wish your infant to have their own coach seat please call us urgently on 01642 257920 to check availability and pay the additional charge. Regulations depend on the airline. Please check with your airline for the correct information. NB. Infant Meals (Hotel Clients) - If you are staying in a Hotel you will be required to pay for any infant meals directly to the Hotel reception. All Hotels offer cot hire, again this is payable directly to the hotel reception. What is the Catalunya Tourist Tax? 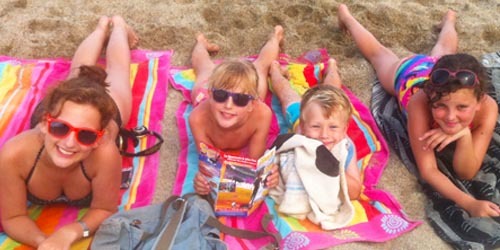 The Catalunya Tourist Tax was introduced by the Catalunya Government from 1st November 2012. It is payable upon arrival directly to the Reception of your Hotel or Holiday Parc. The tax is payable only to destinations inside Catalunya (Costa Brava, Costa Maresme, Costa Dorada), therefore it is not applicable to holidays to Benidorm or France. The amount is limited to a maximum of 7 nights, regardless of how long you are staying, and children under 16 years are exempt. Which days of the week do your Accom-Only holidays arrive ? Almost all our holidays can be booked for ANY DAY ARRIVALS, so you can just choose the best arrival day and duration to suit your transport plans. At certain times, when availability is limited, our changeover days may be restricted to Sundays and/or Thursdays in order to fill our accommodations efficiently, however if you want to arrive on a different day that's possible - you just need to make sure to book your accommodation to cover the actual dates that you need. Is there anything to pay on arrival ? Daily hire charge for the safety deposit box and there may be a returnable deposit for the TV remote control where applicable. If you are travelling with an infant there may be a charge for cot hire which you will pay directly to the Reception. Some apartments offer optional extras such as toaster/kettle hire (it is not usual to find these in Spain). Additionally there will be a hire charge if you wish to use the safety deposit box and a returnable deposit for BBQ equipment. If you are travelling with an infant, cot & high chair hire is available at £2 per item per night or £3 for both, per night (must be pre-booked in UK). 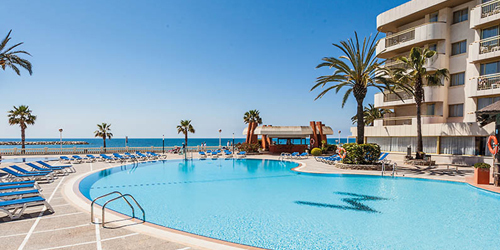 Some Holiday Parcs charge for the use of pool sunbeds and/or parasols and some also charge a returnable deposit for car/vehicle barrier pass. Only for 'optional' extras. For instance, there may be a daily hire charge to use the safety deposit box and a returnable deposit for the TV remote control. If you are travelling with an infant there may also be a charge for cot hire and infant meals which you will pay directly to the Hotel. What is an EHIC card and why do I need one? Everyone who is resident in the UK should have one and carry it with them when travelling abroad. Applying for the card is free and it's valid for up to five years. You can apply online via www.ehic.org.uk or by telephoning 0845 606 2030. Presenting the EHIC entitles you to treatment that may become necessary during your trip, maternity care, renal dialysis and managing the symptoms of pre-existing or chronic conditions that arise while abroad are all covered by the EHIC. The EHIC is NOT an alternative to travel insurance. It will not cover any private medical healthcare or repatriation to the UK or lost or stolen property. For these reasons and others, it is important to have both an EHIC and a valid private travel insurance policy. Some insurers now insist you hold an EHIC and many will waive the excess if you use one. Remember to check your EHIC is still valid before you travel. I have an EHIC - so do I also need travel insurance in Europe? All of these will be covered by a good insurance policy. Some insurers do insist that you carry the EHIC, as they can reclaim some of their costs if you use it - plus the EHIC will cover you for pre-existing medical conditions which your insurer may have excluded. Unfortunately no pets of any description are permitted on our coaches nor in any of our accommodations. What are your rules on smoking ? Smoking is also not permitted inside our Lodges but you may smoke outside your Lodge on your verandah or patio using the ash tray provided. Smoking regulations for Hotels and Apartments vary from location to location. As a general rule, smoking in bars, restaurants and any public areas is often restricted but you can usually smoke on your balcony and outside the main building. Please check with your Reception to be certain. Where can I find up to date travel advice? How long will I need to have left on my passport? From 11pm GMT on 29 March 2019, UK travellers will become “third-country nationals” and subject to the standard rules of admission for citizens of nations such as the US, Japan and Australia. That means there must be at least 90 days (roughly three months) left on your passport beyond your intended date of departure. There is likely to be a surge of applications in February and March as travellers realise what is about to happen and that their Easter holidays in Europe may be jeopardised. Will travel through Eurotunnel be affected? The Treaty of Canterbury between the UK and France governs the Channel Tunnel link and operations will continue as normal – subject to any local disruption at Folkestone and/or Calais. What additional documents will I need to drive in France or Spain? Motorists, whether taking your own car or renting abroad, you are likely to need to obtain an International Driving Permit or two; different EU countries are signed up to different treaties, so for a trip embracing Spain and France you would need both types. These are currently sold from a limited number of Post Offices, but the government intends to make them widely available. The cost is £5.50 for each. You must take your driving licence, additional ID (eg a passport) and a signed passport photo.